S (Scripture): John 17:1 When Jesus had finished saying these things, he looked upward to heaven and said, “Father, the time has come. Glorify your Son, so that your Son may glorify you – 17:2 just as you have given him authority over all humanity, so that he may give eternal life to everyone you have given him. 17:3 Now this is eternal life – that they know you, the only true God, and Jesus Christ, whom you sent. [Eternal life] is not just unending life in the sense of prolonged duration. Rather it is a quality of life, with its quality derived from a relationship with God. Having eternal life is here defined as being in relationship with the Father, the one true God, and Jesus Christ whom the Father sent. So, I see eternal life as “now and not yet”. This relationship with God affects not only what happens when I die, but has a significant impact on how I see myself and the world today. Sorrows will last but a moment, and joy comes in the morning. A road might be blocked to me now, but another path is revealed. A (Application): Throughout my days, I’ve had great relationships with mentors in the faith. Each one reminded me that their relationship with God is what made them who they were. They self-identified as children of God, adopted in baptism into the body of Christ. Somehow, God made that concept of adoption real to me in my young days. This relationship with God that my mentors sensed then flowed through these mentors and pastors and camp counselors and church members, and they each essentially adopted me! I knew God’s adoption, because my forebears of the faith adopted me and made me sense that God was real and cared deeply for me and for how I viewed the world. I often wondered, and still do at times, what made the mentors in the faith so obedient to Christ? My conclusion is this: they sensed that they became children of God by way of the Holy Spirit and baptism, and in a secure identity as a child of God, obeyed God’s commands out of joy, rather than compulsion. How is your identity as a child of God? Are you obeying God out of compulsion or joy? Who have been your mentors in the faith? Take 60 seconds to pause and think about who these people are and think about how they self-identified as children of God. How did they express that relationship? With adoration? 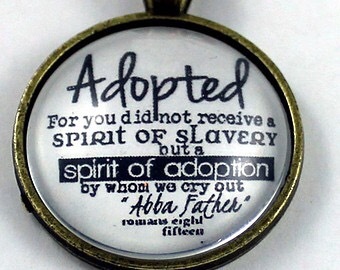 By passing on that spirit of adoption? With love for their neighbors? Feel free to share a comment below to keep this conversation going. Thanks! P (Prayer): Lord, you protect us and claim us as your own. Give us a sense of being your children, that we might joyfully obey you and pass on their spirit of adoption. Amen. This entry was posted in Digging Daily and tagged Adoption, Father, Identity, Mentors, Obedience. Bookmark the permalink.